Evergreen Total Landscape has been providing second-to-none landscaping services to customers in the Tampa Bay area and beyond for more than 25 years. This experience enables us to provide unmatched value because we get the job done right the first time. Our customers can rest assured that plants will be positioned to get the proper amount of irrigation and sunlight, won’t overgrow, and not need to be replaced. At Evergreen, no job is too big or too small. Whether you’re a first-time homeowner needing an irrigation system installed in your new home in St Petersburg, or a property manager looking for condominium landscaping, hotel landscaping, or apartment landscaping, you can depend on the experienced professionals from Evergreen Total Landscape. We also have many years of experience working with HOA landscaping and understand the special needs of association boards. 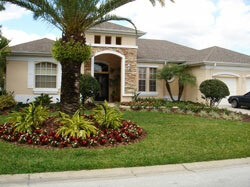 Please call or e-mail Evergreen today for more information on our landscaping services. Whether you live in Tampa, New Port Richey, Clearwater, Lakeland, or any other city in the Tampa Bay area, you can discover why our customers love us.